Nicole Richie is a big fan of her Minnetonka boots. Minnetonka's are so versatile and can be worn in a number of ways, as Nicole Richie has shown us from Summer through to Winter. Nicole Richie in leggings and Minnetonka boots. This is one of my favourite ways Nicole Richie wore the high minnetonka boot. Nicole wore the high Minnetonka's back in 2006 and she is still wearing Minnetonka's in 2009. Minnetonka moccasins seem to stand the test of time! 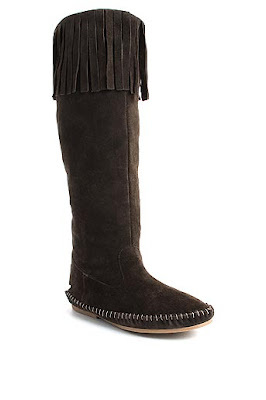 Investing in a pair of Minnetonka's is the perfect boot for the winter. You can shop all the official Minnetonka boots here. They range from £75-£100. Minnetonka's seem to stay around each season but this season there is alot of Minnetonka look-a-likes around. I have selected a few of the best around. 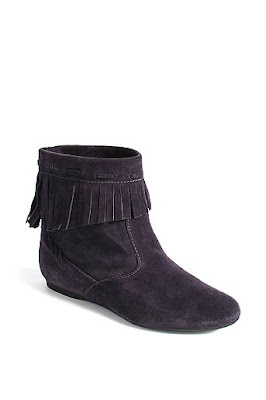 Juicy Couture Tara fringed suede ankle boots - £250. Tan fringe ankle boots from Evans - £35. 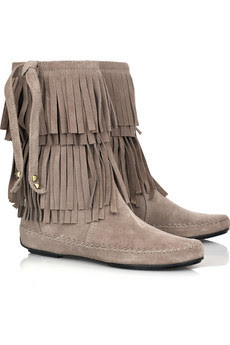 Esprit tassle ankle boots - £62. If you like the fringed boot look but want to wear it in a different way i think a heeled boot or flat sandal is the way forward. Office high heel black suede fringe boots. If you still have the sun where you live these sandals are perfect for wearing the fringed look on your feet and they come in four different colours! 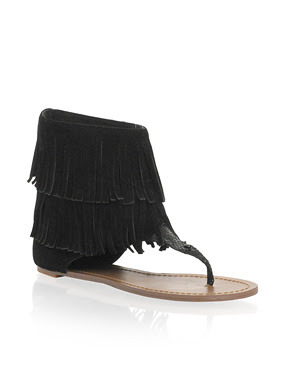 ASOS leather black fringe sandals - £18. How do you wear your Minnetonka boots? I found an Ebay dealer close to me where I just can pick the booties up. But I can't decide: Tramper boots in camel or brown? Whats your choice and why?